Skyzan laser safety software (Calculate NOHD, skin hazard, and aviation hazard distances. Supports complex multi-wavelength lasers). Sponsored for 2017-2018 by Brian Gonzalez of Xtaega. All-in-one Event Report and Notification — Laser Light Show Event Setup, Alignment, Testing and Performance Procedures. This provides information you can submit to authorities before the event, a checklist to follow before and during the event, and follow-up post-event review. Thanks to Brian Gonzalez of Xtaega for creating and freely distributing this four-page PDF file. If the direct link to his document does not work, here is a link to an earlier draft that should work. 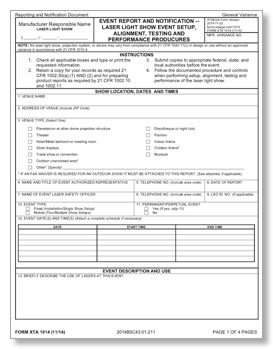 Simple Checklist and Custom Checklist for shows; thanks to Roberta McHatton of Laser Safety Services for creating and freely distributing these checklists. Rockwell Laser Industries: State Safety Contacts Laser displays in the US must also comply with the regulations of state governments. Rockwell, which offers laser safety products and training, has compiled a list of state government contacts. 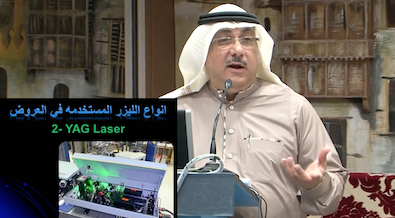 YouTube Laser Safety Video by ILDA Board Member Abdulwahab Baghdadi. May 2016 presentation to the Jeddah Chamber of Commerce, 70 minutes, primarily in Arabic. Audience Scanning Guidelines, a report issued by an international panel of experts at the 1998 ILDA Conference. This is presented for historical purposes, since the "Scanning Audiences at Laser Shows" paper above is more up-to-date. Art vs. Science This article by Greg Makhov addresses several issues regarding audience scanning, such as how laserists can accurately determine the safety of the effect. This article is an excellent introduction for the non-technical person, yet also contains a wealth of hard data for professionals. 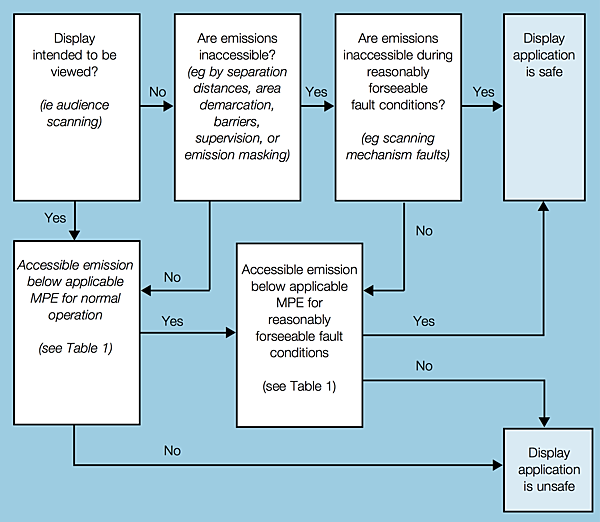 Making Shows Safe and Enjoyable This article by William Benner provides detailed information on how to measure audience scanning effects to make sure international safety standards are met and audiences experience an enjoyable show. U.S. Food and Drug Administration - Center for Devices and Radiological Health The CDRH is responsible for regulating lasers, laser projectors and laser displays in the U.S. The webpage link is for their general “Radiation-Emitting Products” page. 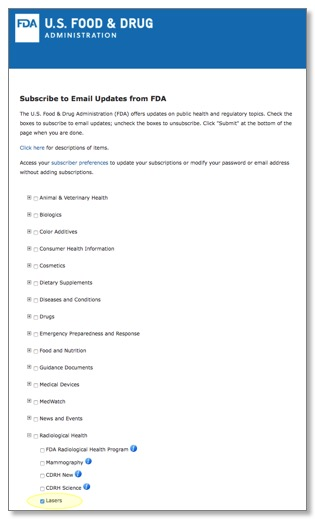 To find specific laser-related information, such as standards for laser projectors, use the “Search FDA” feature. This is because unfortunately, there does not seem to be a single CDRH page that lists links to laser-related information. Public Health England U.K. public authority that works closely with laser display companies, venue managers, promoters and regulators to ensure safe laser shows in the UK and consistent standards worldwide. An excellent overview of general production safety issues that should be considered and controlled. Also contains reference links, a sample schedule for doing risk assessment, and a sample risk assessment form. For ILDA Members only: Skyzan laser safety software (Calculate NOHD, skin hazard, and aviation hazard distances. Supports complex multi-wavelength lasers). Sponsored for 2017-2018 by Brian Gonzalez of Xtaega. Laser Hazard Distance Calculator: NOHD, ED50, and FAA visual interference distances. Has explanatory text to help in understanding how these are used and why they are important. Also has links to other online calculators at the bottom of the page. Beam Diameter and Irradiance Calculator: Beam diameter, irradiance (top hat and Gaussian), NOHD. Also has explanatory text. The three apps below are for Apple iOS devices. Check with your device’s app store to see if there are other laser safety apps available. Laser Hazard Distance (shown above)— Can be used to help determine the safe viewing distance for direct exposure to visible laser beams. The user enters parameters for the output of laser beam and its natural spread, or divergence. Laser Hazard Distance then reports the distance (in meters or feet) that the Nominal Ocular Hazard Distance occurs. It also reports the spot size the laser beam expands to at this point. Laser Show Safety — Users can specify laser output powers from 100mW through to 50W, over a range of different beam characteristics. Specify the distance the laser will be projecting over, and the exposure duration from a range of effects, and the laser hazard checker will calculate the exposure, and any hazard posed at the specified distance. If the distance is too short, the calculator will tell you at what distance exposure becomes safe. The divergence and power of the beam can be altered to establish the optimum settings to help ensure the safe viewing of laser effects against the MPE (Maximum Permissible Exposure) limits. 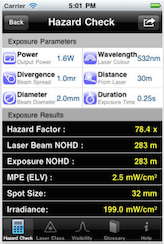 In addition to the useful Laser Hazard Checker functionality the App comes complete with a range of reference tools, providing information on laser class, a useful laser show and safety documentation glossary, as well as an interactive wavelength visibility tool that shows you the color of any visible wavelength, along with information on its apparent brightness under bright-light and low-light conditions. Laser Safety — Laser Safety is a handy reference tool detailing the hazard classifications for laser products and providing important definitions for those working with laser safety. The app also contains visibility tool that can be used to help determine the apparent brightness of laser beams based on their wavelength. LaserPointerSafety.com, a website co-sponsored by ILDA with information about laser pointer safety, and especially, the hazards of pointing lasers towards aircraft. LaserSafetyFacts.com, a proposal for improved labeling that would be on consumer lasers, including mass-produced projectors. The labels would give detailed information about laser hazards and safe projector usage. LaserIncidents.com has a list of databases and resources with laser incidents and accidents. This is for all types of incidents/accidents, so it can help give a comparison of problems with light show lasers versus problems with other types of lasers.